For the first time in its history, San Juan County, Utah, will seat a Native American-majority county commission in January. In an historic victory, after colossal grassroots and legal efforts, Willie Grayeyes won his bid for the District 2 commission seat by 95 votes. That seat was previously held by Phil Lyman, who left it to run a successful race for the state legislature. With his residency in the county and therefore his right to run for the office in question, Grayeyes’ bid for the commission was in jeopardy until a U.S. District Court issued a preliminary injunction in August assuring that the election would proceed with his name on the ballot. Kenneth Maryboy, a Navajo from Mexican Water Chapter, was elected over a write-in candidate to represent District 3, while Bruce Adams, a sitting commissioner, was unopposed in District 1. Grayeyes and Maryboy are Democrats, while Adams is now the commission’s sole Republican. The door to the historic election was opened by a series of legal challenges to San Juan County’s voting districts. The three commission districts had been essentially the same since the 1980s, when the county drew them under a consent decree that also provided that commissioners were elected by district rather than at-large. Those districts allowed for the first election of a Navajo to the county commission by providing for a district where Natives held a majority. However, over time, the Native population grew, yet it was never possible for more than one Native American to be elected to the board because nearly all the Navajos were stacked into the one district, District 3. The Navajo Nation filed suit, demanding that the districts be redrawn, and as a result of a federal judge’s order two years ago, they were. All three commission seats were vacated, with the new members all elected in November. Adams’ term is for two years, the others for four. On Nov. 8, two days after election results were finalized, Utah Federal District Court Judge, David Nuffer, dismissed the Grayeyes case, saying the court cannot provide any other relief to Grayeyes than the preliminary injunction that it issued on Aug. 6. 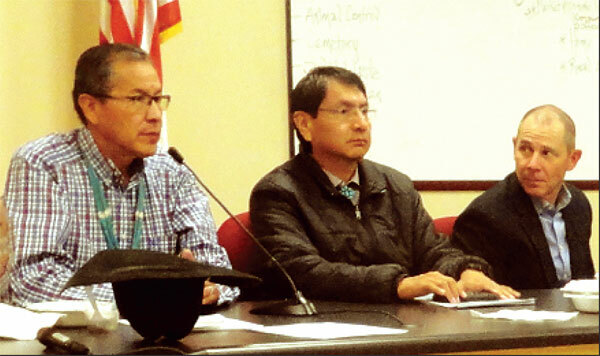 “The Navajo Commission is very satisfied,” said Leonard Gorman, executive director for the Navajo Nation Human Rights Commission, in a press release. His group brought the litigation against the county for voting-rights violations. 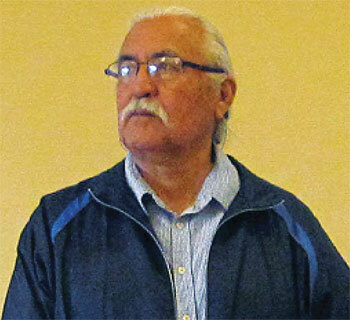 San Juan County has historically neglected the needs of local Ute, Diné, and Paiute communities, said Mark Maryboy, former county commissioner and brother of commissioner-elect Kenneth Maryboy. As an example, he emphasized in a statement from the nonprofit Utah Diné Bikeyah, approximately 40 percent of the Native Americans in San Juan County lack running water and electricity in their homes. Both Native commissioners-elect are excited to address those issues now that the local majority Native American population will be fully represented. According to the 2010 census, Native Americans make up just over 50 percent of the county’s population. But Grayeyes has said he will represent all of the people in his district, pitching a peacemaking platform to white and non-white constituents, a path toward reconciliation. Ken Maryboy was the minority commissioner during his prior tenure, so he is familiar with the job, she said. “But this will be a first for Grayeyes. The commission work is a bureaucratic job. They will both have to make decisions, do the paperwork, while directing county administrators to do the work they will be charged to understand. They’re both up to it,” but will need continued support, she said. Both Grayeyes and Maryboy have served on the Utah Diné Bikeyah board of directors since its inception. The group is the force behind Bears Ears National Monument. Maryboy and Grayeyes were key negotiators during the process with the Obama administration. They are advocates for Bears Ears National Monument, a point of contention for native people who allege the commission greatly misrepresented native support of the national monument in the county. After their election victories, both Maryboy and Grayeyes resigned their positions on the board. Gavin Noyes, co-director of UDB, told the Free Press that the group has since nominated and invited members to fill the vacancies. Noyes is hopeful that the effort Grayeyes is making to heal the divisions in the county will be met with a positive local response. He also sees the broader shift in the state political structure demonstrated in the Utah election results that may turn attention more toward collaboration around the issues in San Juan County that came to light during the years of redistricting and voter rights litigation. He points to the growing efforts of a number of elected officials to reach out to native leadership. The newly elected officials bring collaboration to their constituencies in an understanding that everyone in Utah is needed to address the issues represented in San Juan County. In November Rep. John Curtis, won the seat he was appointed to when Utah District 3 Congressman Jason Chaffetz retired in late 2016. Curtis is demonstrating a willingness to learn from the native communities around Bears Ears that he represents. Last February, he met with Navajo Nation leaders at the Mexican Water Chapter House near the Arizona border. The Navajo Nation president and vice-president, attorney general, and local elected officials from seven chapters attended the meeting. Notably, this was the first time in recent history a sitting member of Congress held a meeting on the Navajo Nation with Utah constituents. Although the get-together was basically about the need for native input and support of the congressman’s ill-fated bill to ratify President Trump’s revocation and replacement of Bear Ears National Monument, Curtis listened attentively to comments on a variety of topics, including discrimination in San Juan County. Navajo Vice President Jonathan Nez attended the meeting. Since then Nez won his bid for Navajo Nation president. He is from the Northern Navajo Agency in the reservation. The Utah Navajo Chapters are also members of the same agency. At the February meeting with Curtis, Nez emphasized the importance of establishing the Navajo tribe as a sovereign nation entitled to government-to-government relations. “While Native people have always honored their treaties, tribal nations often have to remind their federal counterparts to live up to their obligations,” Nez said at the meeting. “We seek your leadership as a voice of reason and fairness to help advocate for local needs. We have the same rights as any other U.S. citizen. We’re asking you to work across organizations to secure our rights and basic equity.” It is expected that Nez will continue his support of the Navajo communities in San Juan County as they seek fair treatment by the county and state government. Farther north in the state, Democrat Ben McAdams defeated two-term Republican Rep. Mia Love by 700 votes in the race for the 4th Congressional District. McAdams, known for his ability to build coalitions and consensus while he served as mayor of Salt Lake County, returned an email to the Free Press on the day Love called to concede the race. Statements such as his, and the reputations of the newly elected Utah politicians advocating support for equitable treatment of all citizens, are giving rise to expectations of successful representation in embattled Native communities like San Juan County. Larry Echohawk, a lawyer and member of the Pawnee Tribe, joined the Obama administration in 2009 as assistant secretary of the Interior for Indian Affairs. He resigned his position at Interior on April 27, 2012. Now, Utah Gov. Gary Herbert has appointed Echohawk to serve as special counsel to the governor on the subject of racism in the state – a move that demonstrates concern for the Native populations in San Juan and Uintah counties. Anna Lehnardt, public information office for the governor, confirmed in an email that the governor and the state attorney general’s office are jointly retaining Echohawk as a special counsel. Echohawk is a revered member appointed by the General Authority Quorum of Seventy of the Church of Jesus Christ of Latter-Day Saints, the first Native American to hold the position. In a phone conversation with the Free Press, former commissioner Lyman said he had inferred from an email on the topic that Echohawk’s appointment was probably more related to the Uintah County Native relationships than San Juan County. Commissioner Adams told the Free Press he had met with Echohawk recently but could not comment further. From December 2018. Read similar stories about San Juan County comissioners.